The Blue Porch @ arts center may be opening on the eve of Groundhog’s Day, but the Thompsons won’t be serving it for lunch. 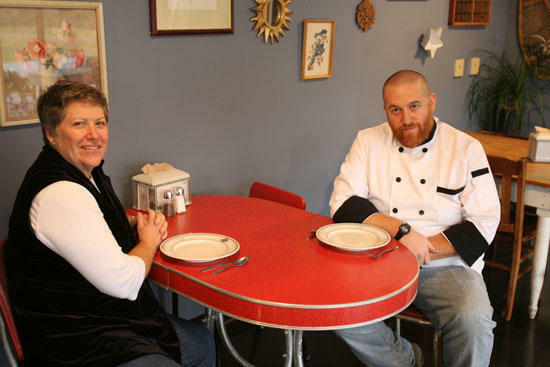 Mother-and-son duo Wanda Thompson and Aaron Thompson first made their mark on the community in 2007 with the opening of The Blue Porch Bed & Breakfast in Readyville. Two years later, they launched a catering business after much success at the Main Street Saturday Farmers Market in Murfreesboro. 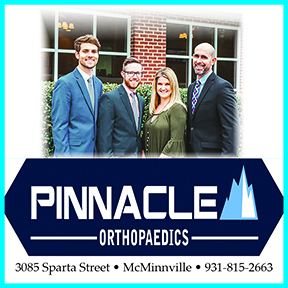 Now, the Thompsons have further positioned themselves in the business community by opening a restaurant within the Arts Center of Cannon County. “We were both ready for a change, so when this opportunity came up, it felt right,” said Aaron Thompson, who spent years as an award-winning photographer for The Daily News Journal before resigning earlier this month. Visitors to The Blue Porch @ arts center are greeted with an array of mismatched tables and chairs. A hodgepodge of vintage décor hangs well positioned on the restaurant’s blue walls, so much so, one might be inclined to remember Grandma’s dining room. The food Blue Porch fans have come to love is served on plates of varying sizes, colors and designs, adding yet another touch to the restaurant’s comfortable feel. “It’s everything you love about The Blue Porch,” Aaron Thompson said. Utilizing local and seasonal veggies, The Blue Porch @ arts center will feature a set daily menu that will alternate three times a year. Additionally, the restaurant will always provide a grilled or baked option and lunchtime salad bar for diners seeking a lighter fare. Soups and daily specials will be announced via Twitter and Facebook, and the Thompsons have plans for a monthly catfish fry, as well. To top off the home cooked meal, try some hand-dipped ice cream or malt milkshake. Patrons can purchase local products ranging from jams and jellies to mustard and hot sauce that will be used in various recipes. Cannon County Chamber of Commerce President Neal Appelbaum noted how the Farmers Market recently relocated to the Arts Center, which will be mutually beneficial to The Blue Porch. Two other restaurants have unsuccessfully attempted to maintain a presence at the Arts Center, but Appelbaum is confident The Blue Porch will be different. “Wanda has established a food following already, and by transitioning to this larger venue that has a regular clientele of theater-goers, she’ll be able to grow her business,” he said. This concept of sharing customers fits into the Arts Center at Cannon County’s initial plans for a restaurant, Executive Director Donald Fann said. “When we originally conceived a restaurant … we wanted it to draw people to the Arts Center who wouldn’t come to the theater otherwise, especially on a regular basis,” he said. Both previous restaurants struggled with this idea and instead counted on the theater-goers as their main source of foot traffic. Audio and video exhibits are available year-round, and Fann thinks The Blue Porch will draw visitors to the center regularly, even when no theater performances are scheduled. While the Thompsons will open their restaurant Wednesday, they will continue working hands-on at the bed and breakfast, catering services and Saturday Farmers Market, Wanda Thompson confirmed. “Our food is good, but our customer service is great,” she said. Breakfast begins at 5:30 a.m.